This novella is solid. I really enjoyed this one. Jeff Strand packs a lot into this little book. It doesn’t transcend the genre, but it does show a different side of apocalyptic horror. From the cover to the tagline, what’s not to like? Missy and Kevin have been friends since childhood. Just friends. The apocalypse hits and people start leaking blood from their eyeballs. They turn into homicidal oozing mutants. Kevin and Missy find refuge in an underground shelter. They’re trapped down there, though. They are isolated for days on end. Things get a little weird in the shelter. Most apocalyptic horror looks at the event–before and after. This novella looks at two individuals who narrowly escape the apocalypse by hiding in a shelter. Their mental and physical health slowly start declining. Can they survive? Do they have enough supplies? Jeff Strand makes you care for the characters. You want the best for them under their circumstance. The author does awkward really well. When two people are stuck in a tight place weird things are bound to happen. The characters drive the story. The apocalypse is basically the backdrop, which makes the tension feel even more real. The storyline is solid. The dialogue is good. 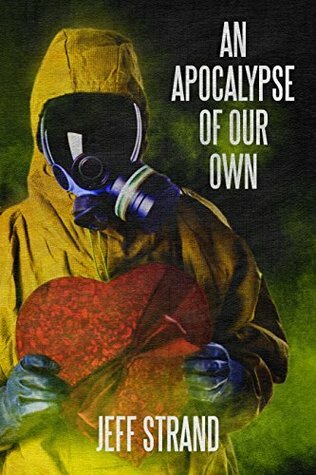 AN APOCALYPSE OF OUR OWN is a great way to spend an hour. It is a quick read and a great escape. You should read it. I will definitely be reading Jeff Strand’s other work.